Elections in the God's abode: Tirupati. 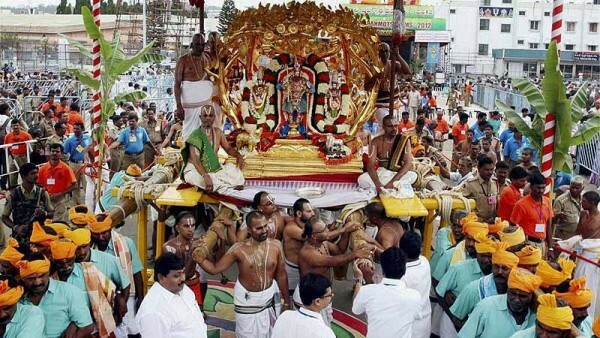 Elections in Tirupati always evoke keen interest among political parties in Andhra Pradesh as the leaders feel privileged to represent the constituency for its religious significance. Both the Tirupati Lok Sabha and Assembly constituencies are considered prestigious. There is always higher demand for Assembly tickets due to the sentiments attached to the temple town. Politicians consider election from Tirupati as God-given gift as it is the abode of Lord Venkateswara temple, said to be the richest in the world. In the elections scheduled on April 11, Tirupati Assembly seat will be witnessing a keen contest between two former chairmen of Tirumala Tirupati Devasthanam (TTD), the powerful body which manages the affairs of the famous temple. Actor Pawan Kalyan’s Jana Sena Party has fielded Chadalawada Krishnamurthy, who will lock horns with another former TTD chairman, B. Karnunakar Reddy, of the YSR Congress Party. Both are former MLAs from Tirupati. They faced each other in an election in the past but this is the first time that they are clashing as former heads of TTD and is said to be the first such contest. Krishnamurthy, who joined Jana Sena six months ago after quitting Telugu Desam Party (TDP), thanked Pawan Kalyan for choosing him to contest. “It is a gift given by the God to serve the people, said Krishnamurthy, who was earlier elected as TDP MLA from Tirupati in 1999. After bifurcation of Andhra Pradesh and TDP forming the first government in the residuary state, Naidu had made Krishnamurthy TTD chairman in 2015. He held the post until last year. Despite leaving the TDP, Krishnamurthy said he would remain indebted to Naidu for giving him the enviable post of TTD chairman. This time, Tirupati is expected to witness a multi-cornered contest as the ruling TDP has re-nominated outgoing MLA M. Suguna. She was elected in 2015 by-election caused by the death of her husband M. Venkatramna. By again fielding Suguna, TDP has done away with its tradition of never fielding an outgoing MLA in Tirupati. It was in 2006 that the then Congress government made Karunakar Reddy the chairman of TTD and he held the post for two years. Telugu superstar Chiranjeevi, who had floated Praja Rajyam Party (PRP), was elected from Tirupati in 2009. He defeated his nearest rival Karunakar Reddy, who was then with the Congress, by over 15,000 votes. Chiranjeevi’s elevation to the Rajya Sabha after he merged PRP with the Congress necessitated a by-election in 2012. Karunakar Reddy, who had switched loyalty to YSR Congress, was elected, defeating nearest rival Venkatramna of Congress by nearly 18,000 votes. TDP’s Krishnamurthy had finished third. In 2014, Venkatramna contested as TDP candidate and trounced Karunakar Reddy of YSR Congress by a massive majority of over 41,000 votes.